Do you have any jelly rolls you don’t know what to do with? This is your project! If you don’t have jelly rolls, you still can make these 2 blocks quickly and easily by using 2 1/2″ strips. 3 pairs of strips of fabric 2 1/2 inch x width of fabric or 42″. If you like my videos subscribe to my channel and follow my blog. Im always fascinated by these blocks, they appear so complex until they are broken down. Such a great tutorial and efficient method. THANKS! Thanks, makes it look so easy. Teresa, you are Terrific ! I follow you on Instagram, utube, and I receive your newsletters ! You never cease to amaze me ! You simplify quilt blocks into bite size pieces . Thank you so much ! Teresa, your tutorials are fascinating and I love this block. I’ve always been afraid to try it till now. Me and my jelly rolls thank you. Now if I can figure out how to square them up for a quilt. Any tips? Midge, you have 2 options. You can leave the edges as they are, with hexagon points (check out the photos of my hexagonal dream pattern for sale), or add half a hexagon made with triangles and place them in the areas that need feeling, and then square it, just cut across from hexagon to hexagon point if you know what I mean. I just had to try this . It is so easy. Great video. But how do I fit that into a quilt? You can make a quilt of hexagons, or hexagons and triangles, there’re different ways to use in a quilt. LOVELOVELOVE!!!!! Another one added to the bucket list. THANKS. Love this block. Can’t wait to make it. I make a lot of charity quilts. I am looking for a way to download the paper 60 degree template used in this pattern and having difficulty. Has anyone been able to successfully download it? How did you do it? I love this hexie block but my Mom who is 95 and doesn’t use the computer could make this with a paper pattern.. I try to keep her mind and fingers active so is there any place I can get a hard copy. I love the tutorial by the way! Sure you ca. You can use my 60 degree ruler template. How do you keep the middle point from getting bulky? There are so many seams there and mine are not laying flat. I’m a very unorthodox quilter. I always press my seams flat. And I press my pieces with steam. I have been trying for 2 weeks to find the pattern for the 3D Hexagon quilt blocks. How can I get it? 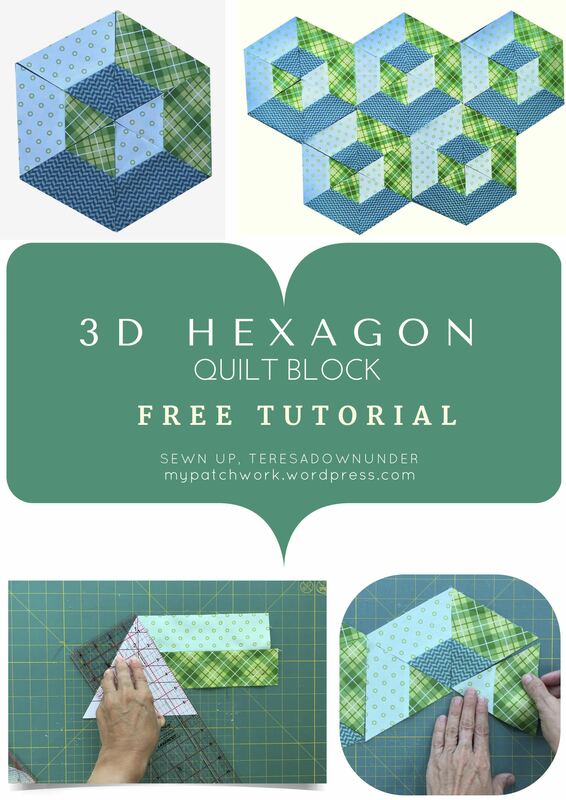 How can I find the quiit pattern for the 3D hexagon quilt blocks? Sorry Mary, I don’t have a pattern on this and I don’t know where to direct you either. Ann, I found this book in Amazon https://www.amazon.com/Quilting-Illusions-Create-Eye-Fooler-Quilts/dp/0764156772/ref=sr_1_5?s=books&ie=UTF8&qid=1505286753&sr=1-5&keywords=optical+illusions+quilts but I can’t tell what’s in it. Love this. However, I’d really appreciate your showing us how to add the background “corners”. Or, could you direct me to where I might find this? Thanks! Do you mean how to square it? I’d add extra triangles and the just square it the quilt, just cut across. Or you can finish I just like that. This video is so helpful. Do you have one on how to piece them all together as a quilt top? Or any tutorials? Sorry I don’t but just sew half hexagons into strips and then sew the strips together. On my bucket list now! Love the tutorial. What the length of the strips? ?